Now there are lots of ways to make a taco salad. But it is fun to switch it up a bit based upon what you have on hand. This time we had almost everything to make a perfect taco salad; beans, peppers, roasted corn, avocado, cilantro, tomatoes. The taco salad I grew up eating had a dressing that went with it, instead of just having salsa and sour cream on top. It was made from Thousand Island salad dressing, salsa and sugar. My mom used ground beef and crumbled up Fritos on top of the salad. You could use 1/2 pound of ground beef and one can of beans if you wanted. We use all beans. 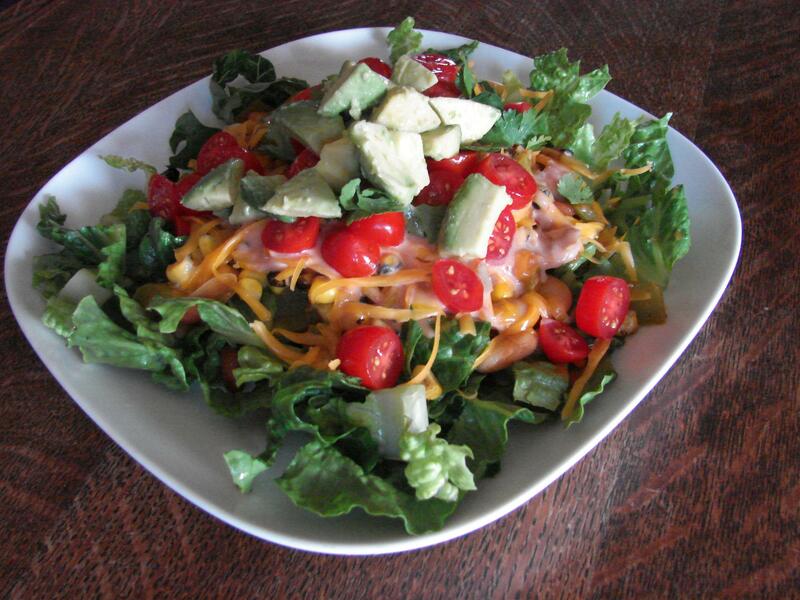 This is our version of taco salad. Heat the oil in a skillet. Add onions and peppers. Saute until they are beginning to get soft. Stir in the seasoning packet and cook for 1 minute. Add in beans and water. Cook for 5-10 minutes or until most of the water has evaporated. Mix together the salad dressing, salsa and sugar. Top lettuce with warm bean mixture and shredded cheese. Add some dressing and whatever else you desire. * Be sure the ingredients are gluten free. I like to use a low-sodium version. * Use any type of beans; kidney, black, pinto, etc. This time I used one can of pinto and one can of white kidney beans. * Trader Joe’s has frozen roasted corn. I cooked up a small portion in the microwave. * Salsa – I made Pioneer Woman’s Restaurant Style Salsa today and loved it. So easy. But I made it with what I had on hand. I used one 28 oz can of diced tomatoes, one 10 oz can of Rotel tomatoes with Green Chiles, a very small onion, 1 Tbsp lime juice, 1 clove of garlic, 1/4 tsp salt, 1/4 sugar, 1/4 tsp cumin and a couple handfuls of cilantro. No jalapenos on hand so I didn’t add them. The green chiles in the Rotel tomatoes give it a little bit of a spicy kick. I am enjoying your blog and your posts… :) Keep up the great work!!! Thanks, Tanya!!! Glad to see you around. Thanks for stopping by!! You might also like my Three Bean Taco post too. It tastes great as a taco salad too.